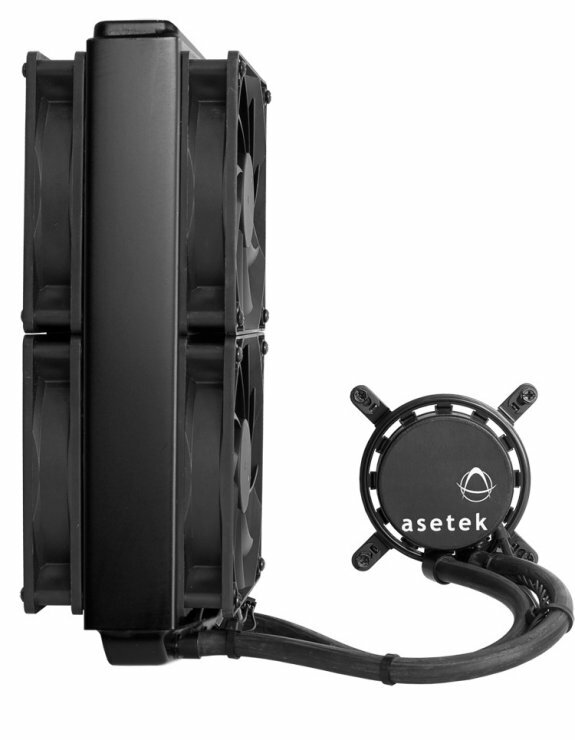 Asetek reveals the WaterChill 2011C, a liquid CPU cooler with a 240mm radiator. Asetek, the industry-leading supplier of all-in-one liquid cooling systems for computers, today announced that the limited edition Asetek WaterChill™ 2011C liquid CPU cooler will be available for pre-order on July 1st, 2011 and shipping out to eager customers beginning in early August. First previewed at CeBit this year, the Asetek 2011C, is a 120x240mm, 4-fan ChillControl-enabled powerhouse. The 2011C showcases the best of Asetek liquid CPU cooling technology. Featuring Asetek’s brand new 1.5” thick 120x240mm radiator and four fans in push-pull configuration, the 2011C dominates the competition. The low-profile pump is fitted with Asetek’s 3rd Generation coldplate technology and supports interactive fan control technology for all four fans. A USB connection on the pump enables sophisticated user control of fans and lighting effects via Asetek’s ChillControl software app.